I am writing to update you on the next exciting step in the transformation of further education in and around Nottingham to ensure that Nottingham and Nottinghamshire students are equipped with the skills and experience they need to better meet the requirements of employers. You will be well aware of our plans to launch a new vision for FE for our City, to ensure our students are equipped with the skills and experience to better meet the requirements of employers. As I have mentioned before Nottingham College is being refocused around an employment led culture that aims to get our students into work, either directly or via higher education, with a clear aspiration to promote personal independence. Development of our new City Hub campus, as a state-of-the-art facility, linking employers and students under the same roof, is a pivotal step in this journey. I am delighted to be able to tell you that at the Council’s planning committee on Wednesday 21st February the College’s plans were approved. Our plans were part of a larger announcement of the plans for the Broadmarsh Car Park development so the two decisions will represent a key milestone in the area’s whole regeneration. The new proposed City Hub campus is located and accessed off Canal Street on a disused brownfield site adjacent to the soon-to-be-developed intu Broadmarsh Centre, bus station and car park. We are proud to be part of a wider regeneration scheme which will see around £250m of investment into this Southern Gateway area of the City. The College submitted its plans for the City Hub campus back in November 2017. This followed a public consultation exercise and a rigorous design process, led by our team of architects and informed by SLT, a group of students and staff, Governors, English Heritage, the City Council and other key stakeholders. The planning decision came with a set of conditions that we will need to be considered before development of the new campus commences in summer 2018. The project remains on-track and within budget and will open its doors to its first cohort of students as planned in 2020. You can keep up to date with developments via the College web page. The new City Hub campus will provide improved learning resources, facilitate increased regeneration for the area and provide greater opportunity for students and their future employers to come together under one roof to collaborate on the curriculum we offer and the skills we nurture for the benefit of our local and regional economy. The campus alone represents an impressive £58m investment in education, made possible thanks to support from the D2N2 LEP and Nottingham City Council. The new campus is a centre point of the College’s broader estates strategy which will see rationalisation of our property portfolio post 2020, to enable further investment in our retained estate and in facilities and resources for our students. 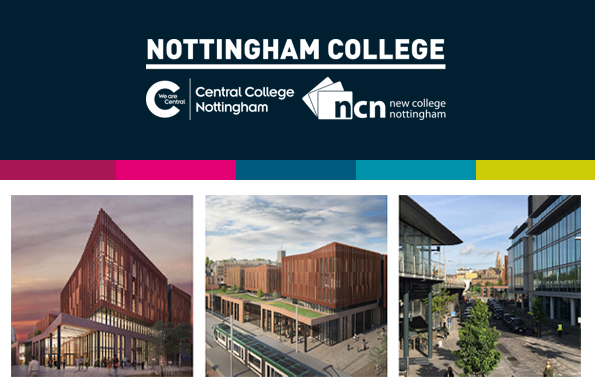 This is an exciting time for the College and for Nottingham as a City and over the coming months, you’ll receive more updates about our ongoing transformation programme. As always, if you would like any additional information about the City Hub or about the College’s plans going forward I’d be delighted to share these with you. Please do get in touch with Irene Beard<mailto:irene.beard@nottinghamcollege.ac.uk> in my team or call 0115 838 0524 and we can take it from there. Thank you for your continued commitment and support to Nottingham College. This post may be taken as my support for what is happening to Central College. That is not the case. In my opinion the closure of the facility in Beeston is very damaging to Broxtowes’s local economy. Yet again, this is centralising services in to the City at the expense of surrounding districts. NET even built a tram stop at this location on Chilwell Road. This also concerns me to the future of the facilities at the Arthur Mee Centre in Stapleford which is used by many people. Maybe one of the County Councillors for this area could find out and let us know what’s going to happen. Disappointing to see negative comments being made on here on what is excellent news for our local area. Interest has already been expressed in the Beeston site being used for much needed school provision and rather than seeking to stifle such developments it would be good to see local councillors play an active role in helping to see ideas are brought forward. Negative comments, I don’t think being concerned about the future of the Arthur Mee Centre in Stapleford which is used by so many people is being negative. Agreed Richard. However you are speaking about Stapleford, Joan is speaking about somewhere else.